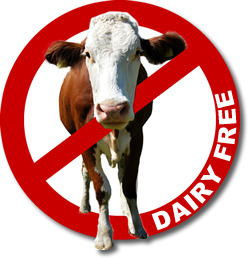 "Try to go Dairy Free"! My friends- this was the worst news, as I am addicted to CHEESE & Chocolate! Beckett had a HORRIBLE acid rash on his hiney that we could not get rid of after 2 weeks of trying everything (It was bleeding,peeling, & bright red) plus he was extremely colicky, had a terrible belly ache every evening, and had acid reflux. I felt like the worst mommy ever and I was willing to try anything to make it go away even if that meant giving up the most wonderful food on earth. Here is Beckett in his Cloth Diaper we tried first to get rid of the rash. Now we always cloth! She said try it for 2 weeks if symptoms don't improve then we know it wasn't the dairy. Well just 3 days into it his rash started getting better and there was my answer. I was officially Dairy Free! Everyone I told just said "Quit breastfeeding so you can eat what you want" that was in no way an option for me, I would give up anything to make my baby boy happy & healthy! I quickly learned there are a lot of replacements for things that are just as yummy! 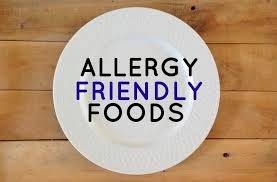 Most restuarants have an allergen menu online so I would just look up what I would eat prior to our visit to the restaurant, you can also usually ask the manager to prepare your food without butter etc. if you cant find an allergen menu! Caution some people do not understand food allergies/intolerance; I could not tell you the number of times I would get "all we can do is give you the gluten free option"... UGGHHHH- I just sighed everytime, said "bring me a water", & prayed for our uneducated society! Also note- fries are not usually an option because all fried foods go in the same oil! About 1 month later some of his belly aches returned. His Pediatrician asked me to keep a food diary for a week. I consumed an ungodly amount of peanut butter (what can I say I love it! & I don't eat a lot of meat so its great protein). She said again 'cut it out & see what happens'... again success; I was now a dairy free & peanut free mommy. Repeat after me *** ANYTHING FOR MY BABY*** This process repeated yet again a few weeks later and I was asked to also lose ALL CAFFEINE! (Thats no cheese, no chocolate, no peanut butter, & no diet Dr Pepper!) At that moment in life I thought all things delicious were done for in my diet but the positive note was that I could lose weight by only eating spinach & celery right?!?! HAHA! Another good note was that at 4 months I could try to reintroduce one thing at a time to see if he could tolerate it yet! I prayed every day that Becks would not grow up to be allergic to all these things! Little Caesars pizza can be ordered with toppings minus the cheese! Breastfeeding is the most difficult but rewarding part of motherhood and cutting out all those yummy processed foods is extremely difficult but the health & comfort of my baby boy is all I need to make it worth it! What did you give up to continue to breastfeed? 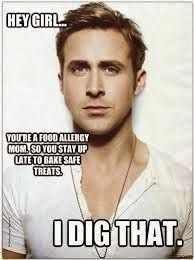 What other food could you add to my list of allergy friendly yummies?